I am not a big fan of "diet" oolong tea. However, there are so many queries from visitors that I am tempted to buy one myself to evaluate. 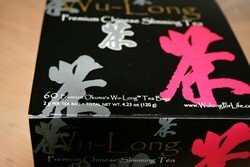 When my friend Melvin asked me to review a tea that he purchased from wulongteaforlife.com, I gladly obliged. May burn 2.5 times more calories than green tea. This claim is based on a 2003 study by Komatsu from the Tokushima School of Medicine in Japan. It has been mis-interpreted by commenters ever since. First, Komatsu never concluded oolong tea can burn more fat than green tea. Second, the test subjects drank either green tea powder (5 grams) or oolong tea leaves (15 grams). They are clearly not intended to be directly comparable. Third, the test may not be accurate. The experiment lasted only 1 day with 11 young females. It used Douglas bags for gas analysis, which is less accurate than the modern method. For a full discussion, please read Wulong Tea Weight Loss. According to Okuma Wu-Long Tea, eating too many carbohydrates causes weight gain by increasing insulin levels. Insulin is your body's "fat-storing" hormone. Oolong tea helps lose weight by blunting the insulin rise. Both green tea and oolong tea complement diabetes treatments so I think this is a valid claim. This refers to a 2001 Japanese study where 63% of eczema patients showed marked to moderate improvements after 1 month. According to Okuma Wu-Long Tea, a 2004 study found that "the nutrients in this kind of tea produced a remarkable 50 percent reduction in free radicals (which cause signs of aging) within just 15 days." This is true. However, the same study also found that green tea reduced free radicals by an impressive 100% over 40 days. According to Okuma Wu-Long Tea, another 2004 study published in the scientific journal Antioxidants & Redox Signaling found that the nutrients in this kind of tea were shown to help bolster the immune system, thereby helping reduce your risk for infections such as the common cold. The $37 package came with a pack of 60 teabags nicely wrapped up. It was delivered via DHL Global Mail that also offers tracking service. According to Okuma Wu-Long Tea, "this is a full-bodied, hearty yet sweet premium tea with hints of chestnut imported directly from Mt. Wu Yi in China's Fujian Province." 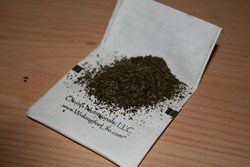 I steeped the 2-gram teabag according to instruction using hot water (about 150 Fahrenheit) for 3 to 5 minutes. It yielded a dark orange tea liquor with a nice cup aroma. The body and aftertaste, however, are light and somehow bland. It is slightly sweet chocolate-ly and not bitter, which is good. But definitely not full-bodied and chestnutty. This really is not the premium Wuyi Oolong tea I expect. But it is not bad for a teabag either. Melvin wasn't too happy so he asked for a full refund. Okuma Wu-Long Tea responded quickly and seemed helpful. To ask for a refund, simply email and ask for an authorization number. Return the unused tea within 30 days of receipt. You won't get your delivery costs back. But that is the standard industry practice anyway. At 60 cents per teabag, Okuma Wu-Long Tea has a premium tea price tag. I drink loose tea all my life. It may be unfair for me to judge, but the teabags really taste nothing like a real Wuyi Oolong Tea. If you wonder what Wuyi Oolong Tea is about, click here. Of course, teabags have some advantages. It is convenient to prepare, especially if you are in the office. Caffeine extraction is higher, which may increase weight loss. But there also disadvantages. They taste bad. Manufacturers also tend to use poorer quality leaves. If you want to buy from Okuma Wu-Long Tea, by all means go ahead. They now offer a loose-leaf option. This is a company with real people who provide a great service. If you are not happy, they will refund.